Brittain Ashford on autoharp and Gelsey Bell on tambourine give haunting performances in “Gost Quartet” as part of the series, Curran: Under Construction. ‘Tis the season of the witch, and there is no better way to spend a ghoulish evening than at the Curran Theater, experiencing “Ghost Quartet,” composer Dave Malloy’s musical homage to ghosts and to that thin line between this world and the beyond. Malloy won a passel of awards for his Off-Broadway pop opera “Natasha, Pierre, & the Great Comet of 1812.” For “Ghost Quartet,” he replicates the musical format but builds the songs around a theme, the afterlife, rather than a source, “War and Peace.” The result is a song cycle with an amorphous texture rather than a linear montage. However, there are recurring elements that bind the text. Sister Rose who died as a child, the House of Usher, and whiskey (which was served at the opening) are all revisited. Malloy designs intimacy into the production by choosing small spaces wherever “Ghost Quartet” is performed. The cast is limited to four instrumentalist/singers who are spread around the edges of a confined audience, creating the effect that “they” are among us. The music draws on a multitude of sources, delivering a highly tuneful, modern sound that in the aggregate is akin to folk pop. That said, the song “Soldier and Rose” exhibits Middle Eastern and country music elements, and “Monk” is a musical tribute to jazz great Thelonious Monk, one of Malloy’s influences. The driving, haunting cello work that frequents the evening is much like The Beatles darker sound, especially “Eleanor Rigby.” Blues and electropop also make a showing. The backbone of the arrangements is Malloy’s keyboard, Brent Arnold’s cello, and Brittain Ashford and Gelsey Bell’s percussion and percussively-played tonal instruments from autoharp to metallophone. Arnold also performs on guitar and the most sonorous sounding imaginable erhu, which is conventionally used in dissonant Chinese music. All four sing, but here, the women shine both in solos and ensembles. Although both can belt out a tune, Ashford’s vocal quality is more lyrical and Bell’s more dramatic, with both being used to good effect. It is rare to say that a venue profoundly influences the enjoyment of a performance, but this is an exception. Some readers may have observed a disconnect between earlier references to the Curran Theater and small performance space. This production is part of Carole Shorenstein Hays’ clever “Under Construction” series offered during the theater’s rehab. The small space is the stage, which holds an audience of 100 or so and the performers. The low-slung seating is on the three sides other than the stage front, where the two women performers are situated. So all in the audience face toward the vastness of the unlit 1,600 seat theater. And now it is time to mention the brilliant lighting designed by Christopher Bowser, another difference maker. Lighting the stage itself are several chandeliers that could be in many homes plus spotlights, but the star of the light show is the massive chandelier, high over the orchestra seating. At times, it is slightly lit, evoking a spooky, shimmering omen in the distance, and other times its candle lights appear as a hundred bright stars clustered together. However, the unique lighting decision is to blacken the whole interior space, save for several distant light dots that give the appearance of a constellation in a pitch black sky. The total darkness lasts through five songs – perhaps 15 minutes – broken only by occasional barely visible spotlightss on one or another of the performers. The mesmerizing effect evokes the sense of the spirit world without resorting to crass representations. Well, is there a message to this delightfully engaging musical? A spoiler alert, might be offered here, except that the revelation occurs in the seventh of 23 songs in the program. And the answer is – “Any Kind of Dead Person” would prefer to be a ghost! Who’d ‘ave thunk it? “Ghost Quartet” continues at the Curran Theater, with five more performances, October 28th through October 31st. For further information, click here. “Ghost Quartet” music, lyrics, and text by Dave Malloy; developed and arranged by Ghost Quartet, presented by Curran: Under Construction. Director: Annie Tippe. Production and Lighting Design: Christopher Bowser. Sound Design: Dave Malloy. Brent Arnold: vocals, cello, guitar, erhu. 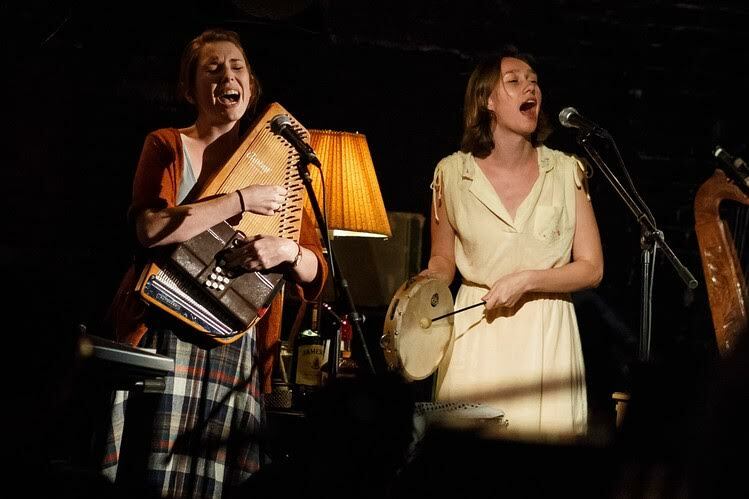 Brittain Ashford: vocals, autoharp, percussion. Gelsey Bell: vocals, metallophone, percussion. Dave Malloy: vocals, keyboard. Posted in Reviews.Tagged Annie Tippe, Brent Arnold, Brittain Ashford, Charles Kruger, Christopher Bowser, Curran: Under Construction, Dave Malloy, Gelsey Bell, Ghost Quartet, San Francisco theater reviews, theatrestorm, Victor Cordell.